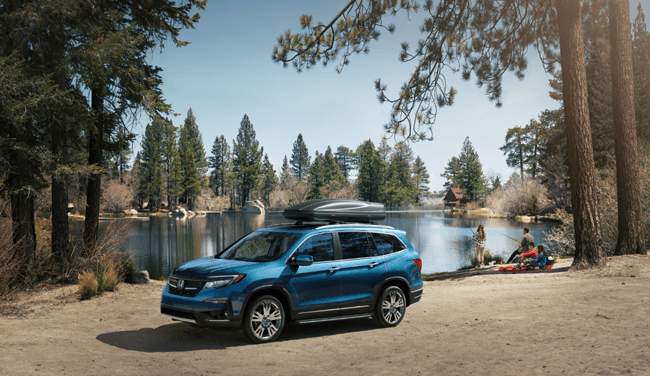 The redesigned and refreshed 2019 Honda Pilot arrives on August 24, bringing with it a long list of upgrades. The numerous changes include a bold exterior styling, an available new hands-free power tailgate, substantial powertrain refinements, upgrades to connected-car technology, a standard new Display Audio touchscreen system with Apple CarPlay™ and Android Auto™ integration, and a volume knob. Combined, the upgrades to Pilot reinforce its capabilities while emphasizing the state-of-the-art technology and family-friendly character that has made it popular among midsize 3-row SUVs. The pilot also remains one of the few models in its segment to offer 8 passenger seating (7-seats with the optional second-row Captain’s Chairs), with three-person capacity in both the second and third rows, and with third-row access made simple and easy by the available One-Touch Walk-In feature. For 2019, Honda will introduce a new, Canadian-exclusive Black Edition trim featuring gloss black accents, black wheels, darkened headlights and taillights, red ambient lighting and red-accent stitched leather seats on the interior and Black Edition emblems on the exterior. All 2019 Pilot’s features a bold front and rear styling to complement the Pilot’s robust all-weather driving capabilities, supported by Honda’s standard intelligent Variable Torque Management system (i-VTM4) with true torque-vectoring. Standard i-VTM4 uses an electronically-controlled, hydraulically-actuated rear differential to apportion engine torque between the front and rear axles, and dynamically distribute torque between the left and right rear wheels. The benefits are superior all-weather handling, and neutral, accurate steering under power. In addition, the 2019 Pilot’s 9-speed automatic transmission, available in the Touring 7 passenger, Touring 8 Passenger and Black Edition trims, gets new tuning for enhanced drivability and smoother shifts, while Pilot’s Idle Stop system now provides quicker restarts and more seamless operation. Contact London Honda’s Sales Team for more details.